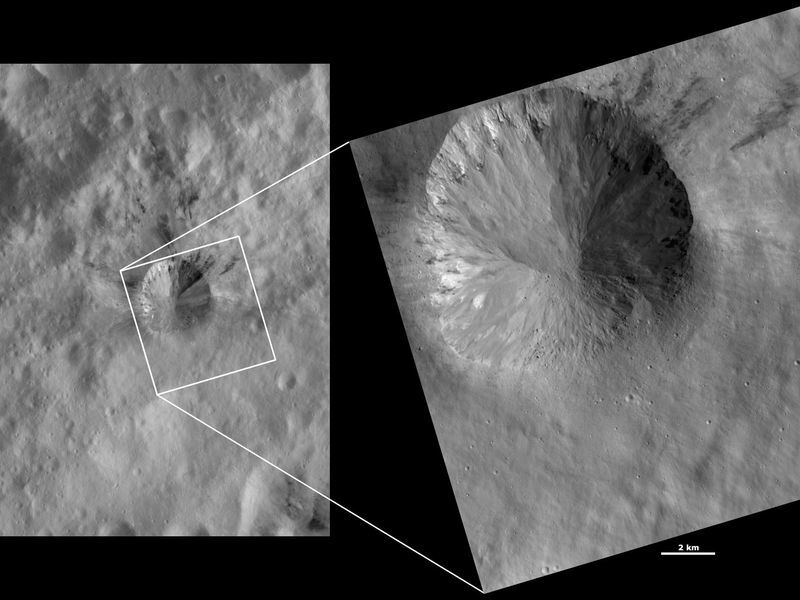 These Dawn framing camera (FC) images of Vesta show Rubria crater at both HAMO (high-altitude mapping orbit) and LAMO (low-altitude mapping orbit) resolutions. The left image is the HAMO image and the right image is the LAMO image. Rubria is the crater in the top left of the LAMO image. The LAMO image is approximately three times better spatial resolution than the HAMO image. In images with higher spatial resolutions smaller objects can be better distinguished. The spectacular detail of Rubria crater is clear in the LAMO image. For example, there are boulders on the bottom side of the crater. They can be distinguished from small craters, which cast shadows to the right, by the shadows that they cast to the left. Also visible is the fine-scale intermingling of dark and bright material around the left and top rim of the crater, which can only be partially be seen in the HAMO image. There are also a large amount of streaks and slumps of material along the crater walls that are much clearer in the LAMO image. 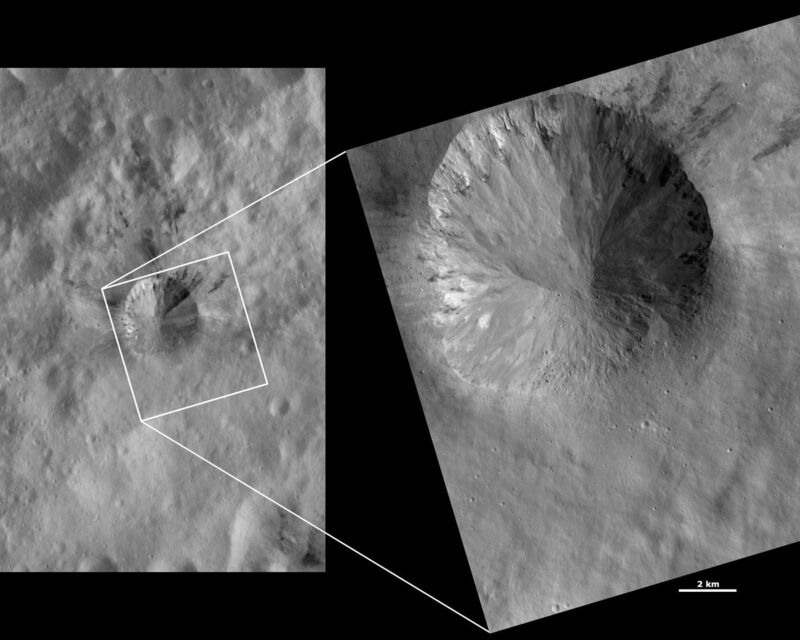 These images are located in Vesta's Gegania quadrangle, a little south of Vesta's equator. 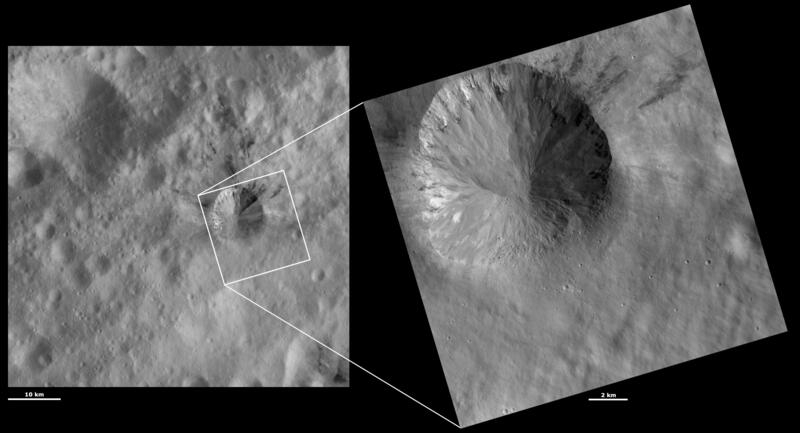 NASA's Dawn spacecraft obtained the left image with its framing camera on Oct. 22, 2011. This image was taken through the camera's clear filter. The distance to the surface of Vesta is 700 kilometers (435 miles) and the image has a resolution of about 63 meters (207 feet) per pixel. This image was acquired during the HAMO (high-altitude mapping orbit) phase of the mission. 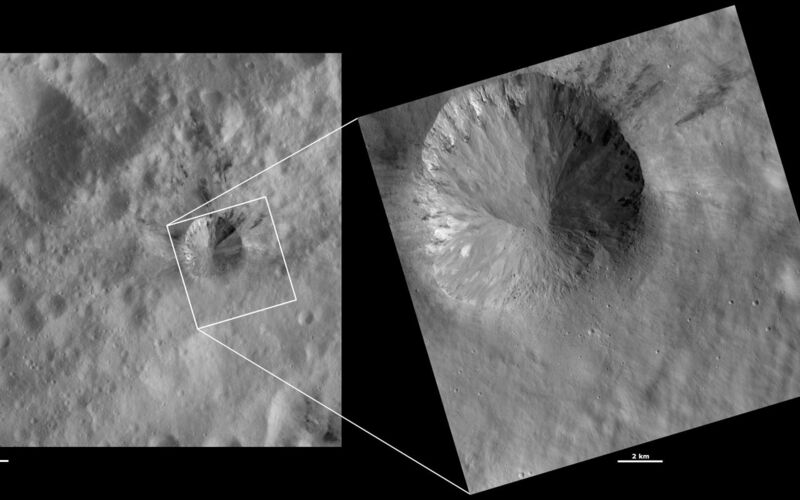 NASA's Dawn spacecraft obtained the right image with its framing camera on March 16, 2012. This image was taken through the camera's clear filter. The distance to the surface of Vesta is 272 kilometers (169 miles) and the image has a resolution of about 17 meters (56 feet) per pixel. This image was acquired during the LAMO (low-altitude mapping orbit) phase of the mission.